The Department of Commerce (DoC) is the nodal department for enabling infrastructure development related to ICDs, CFSs and Air Freight Stations (AFSs) and coordinates resolution of inter-departmental issues. The IMC was constituted by a Ministry of Commerce resolution in March 1992 to act as a Single Window Clearance for the proposals for setting up of ICDs, CFSs and AFSs. The terms of reference of the IMC include specifying the parameters and guidelines for the approval of all new ICDs/CFSs. After approval of proposal by the IMC and issuance of the Letter of Intent (LoI) by the DoC, once the required infrastructure facilities are created, necessary permissions, EDI nodes and Customs staff are provided by the Customs department to make the ICD/CFS/AFS functional. Audit observed that two sets of guidelines for setting up of ICDs/CFSs/AFSs were available on the website of the DoC. However, none of the guidelines mention the notification or memorandum through which they have been formalised or the date from which these came into effect. DoC in their reply (January 2018) stated that while uploading the revised guidelines, the old guidelines were inadvertently not removed from the website by NIC. The Office Memorandum (OM) containing the minutes of the IMC meeting held on 19 September 2017 wherein the revised guidelines were approved was separately available on departmental website http://commerce.gov.in. They also stated that no separate notification or memorandum for framing the guidelines was required as these have been framed as per the Terms of Reference of IMC. Though the DoC stated that there was no requirement for separate notification, their response does not address the fundamental issue of lack of a framework defining the objective and intent of setting up, functioning and monitoring of ICDs/CFSs. The existing guidelines lay down a checklist of steps to be followed while granting approvals that are more procedural in nature, and there is no policy document or framework laying down principles and objectives which would help the IMC members to evaluate the proposals. Further, no roles and responsibilities have been defined for the IMC or its constituent ministries beyond the approval process, leaving the sector unregulated. Audit would like to draw the attention of the Government to legislations that pertain to major and non-major ports and land ports which provide a framework for setting up, laying down an administrative structure and providing a regulatory framework for such ports. Further, Audit found two sets of guidelines which are available on the webpages (http://commerce.nic.in/ trade/national_tpa_guidelines.asp and www.commerce.nic.in) without any reference to a notification or memorandum to establish which of the two sets of guidelines are applicable and the date from which these have come into effect. Being nodal agency for setting up of ICDs and CFSs in the country, DoC is expected to be a repository of all the basic data relevant to setting up and operation of ICDs and CFSs, such as their number, location, operational status (i.e. functioning or closed), installed capacity, performance in terms of operating capacity, etc. This data is essential for ascertaining the viability of the proposed ICD/CFS project with reference to the number and performance of existing ICDs/CFSs in the project area and hence can serve as a valuable input for the IMC in the project approval process. DoC was asked (July 2017) to provide data on ICDs and CFSs which were established before and after the setting up of IMC in 1992. DoC provided a list of 236 ICDs and CFSs which had become functional after the setting up of IMC and stated (July 2017) that they did not have data of ICDs and CFSs set up before 1992 but the CBEC may be having such data. The CBEC was requested (July 2017) to provide the said data, but no information has been furnished till date (February 2018). In an effort to collect comprehensive data regarding number of ICDs and CFSs functioning in the country, including those established before the creation of IMC in 1992, Audit referred to other sources of information including information available in public domain on internet5. It was observed that this information only contained data on ICDs/CFSs post 1992 and thus was incomplete. From the data on ICDs and CFSs setup after 1992, as maintained by the DoC, Audit noticed at least 27 instances of incorrect reporting and non-updation of status (Statements 1, 2 and 3). Moreover, in the map depicting the state-wise count of ICDs/CFSs, as displayed on the MoCI website (www.imcdryports.commerce.gov.in/home.php), the number of functional ICDs in Nagaland is shown as eight, although as per the jurisdictional Customs commissionerate (Shillong), no such units exist there. Further, eight units have been reported as ICDs by the jurisdictional Customs but they are being reported as CFSs in DoC data. Audit noticed that though the DoC guidelines require the ICDs and CFSs to send Quarterly Progress Reports (QPRs), no such QPRs were being submitted. Audit found that only four6 ICDs/CFSs out of the 85 test checked in audit were sending such QPRs to the DoC. Although the DoC have stated that they send reminders to the developers to provide the traffic details directly to DoC, no such reminders were found in the DoC files. Thus, it is observed that the nodal ministry dealing with the setting up and functioning of ICDs/CFSs in the country has no reliable data on the number and status of functional ICDs and CFSs in the country. DoC in their reply (January 2018) stated that Department maintains a database of ICDs/CFSs/AFSs for which IMC has accorded LoI for setting up of the facility and conducting operations under the Customs Authorities. In accordance with the terms of reference of the IMC, once an ICD or CFS commences its operations, the IMC has no role and it is governed by the provisions of the Customs Act and the Handling of Cargo in Customs Areas Regulations (HCCAR) 2009. The operational data is available with Customs, under whose jurisdiction the ICD/ CFS operates, and they provide the same to IMC as and when required, after doing their own due diligence. Further, in respect of discrepancies highlighted by audit, DoC stated that it is due to the interpretation of the word “Functional” by Audit in reference to data obtained from DoC and field offices of Customs and DoC. It was stated that in view of the audit observation, the same has been modified as “F= Commenced Operations” to clarify the interpretation. DoC also informed that in view of the observations of Audit, the data regarding ICDs/CFSs/AFSs has been sent to the CBEC for clarification and updation and shall be updated on receipt of information from them. Regarding incorrect depiction of ICDs in Nagaland, DoC stated that the map on the online module was under development and the same was developed after due corrections. DoC’s response that IMC has no role after the ICD/CFS commences operations is not acceptable. Being the nodal agency for ICD/CFS approvals, they are expected to be the custodian of comprehensive database on all ICDs and CFSs in the country which have been approved, and are functioning or closed. The provisions of the Customs Act and the Handling of Cargo in Customs Areas Regulations may not be sufficient in themselves to monitor the operations of ICDs/CFSs as these are geared towards safeguarding of government revenue and Customs controls, rather than monitoring the operational performance of these units. Although DoC’s response regarding modification of “Functional” status of ICDs to “Commenced Operations” might have addressed the interpretation issues, it still does not address the larger problem that there is lack of a single reliable source of data on the number of functional/operational/closed ICDs and CFSs. Although DoC was in a position to maintain data on functional status of ICDs/CFSs in the country from the QPRs required to be submitted by the ICDs/CFSs, it did not take effective steps to ensure their submission and collection of data therefrom. Further, Audit could not verify the reply regarding status of ICDs in Nagaland as the URL in which the updated map was uploaded have not been provided (February 2018). The setting up of ICDs and CFSs leads to creation of infrastructure for handling of containerised cargo and facilitates the country’s foreign trade, in addition to helping in decongesting ports and bringing Customs clearance facilities to the doorstep of importers and exporters. Audit observed that the DoC does not call for any data on the installed capacity of the ICDs and CFSs for granting approvals. From the prescribed application format for setting up of ICDs and CFSs, it is noticed that this information is not called for from the project developers and they are required to furnish only the import/ export traffic projections for the area they are being set up in. Source: Data furnished by local Customs Commissionerates. It is observed that nearly forty per cent of these ICDs and CFSs were operating at less than half of their installed capacity and another one third were operating at between 50 to 75 per cent of their capacity. Out of the ten audited units in Maharashtra, capacity utilisation data was available for nine units (four ICDs and five CFSs), which shows that one (ICD Butibori) had become non-functional, seven were under-utilised7 and only one (Navkar Corporation CFS) was working above its installed capacity (104 per cent). In Pune, four ICDs (Talegaon, Dighi, Chinchwad and Pimpri) were functioning within a 50 Km radius and the best performing among them, ICD, Talegaon, was functioning with a capacity utilization of only 31.73 per cent (5-year average) while the other three had a capacity utilisation of less than 7 per cent (ICD Dighi - 6.21 per cent, ICD-Chinchwad - 6.64 per cent, ICD Pimpri - 3.46 per cent). In spite of such low capacity utilization, an LoI for setting up of one more ICD at Bhamboli, Chakan, Pune was granted to APM Terminals Pvt. Ltd. in November 2016. Source: Data furnished by local Customs Commissionerate. Thus, setting up of another CFS in the vicinity of existing CFSs where handling capacity was already under-utilised did not provide any additional benefits by way of providing greater decongestion of the gateway port. On the other hand, it seems to result in shifting of business from an already existing and high performing CFS to a new one, thereby adversely impacting its business. It is further noticed that another LoI has been issued9 in October 2016 for setting up one more CFS at Kolkata port, leading to further proliferation of CFSs at the port. In Haldia Dock Complex (HDC) under the Kolkata Port Trust, Audit noticed that HDC had an installed capacity of 2.5 lakh TEUs whereas its actual cargo handling requirement was 1.36 lakh TEUs and projected future cargo handling requirement was 1.5 lakh TEUs for 2017-18. Due to available spare capacity with the port itself, the capacity utilisation of the four CFSs attached to HDC was only 15.5 per cent during 2016-17. In JNPT Mumbai, the capacity utilisation10 in 13 out of the 27 CFSs around JNPT Mumbai was reported to be in the range of 60-65 per cent in 2012 while in Chennai Port the capacity utilization in 2012 in 16 out of 29 CFSs was reported to be in the range of 56 per cent. The IMC approved the setting up of ten more ICDs/CFSs in Maharashtra and twelve more in Tamil Nadu (including six in Chennai) during the period 2012-2017, resulting in further proliferation of ICDs/CFSs in these states. The above capacity utilisation statistics and number of approvals granted for setting up of ICDs/CFSs in locations where under-utilised units already exist, shows that such approvals were granted without a proper need and/or impact analysis and had resulted in proliferation of under-performing ICDs/CFSs in areas like Mumbai, Chennai, Kolkata, Haldia and Pune. Scrutiny of the approval process revealed that although the IMC examines and grants approvals as per MoCI guidelines laid down and on the basis of comments furnished by the jurisdictional Commissioner of Customs and the concerned Port Authority, the guidelines neither lay down the criteria which the Port/jurisdictional Customs authority should consider while offering their comments, nor the criteria which the IMC should consider while examining proposals for setting up of ICDs/CFSs. Moreover, as already stated above, the prescribed application form does not call for any data on the existing and actual capacity utilisation of ICDs/CFSs already located near the project area, although this information is essential for arriving at an informed decision on the viability of the proposed project. 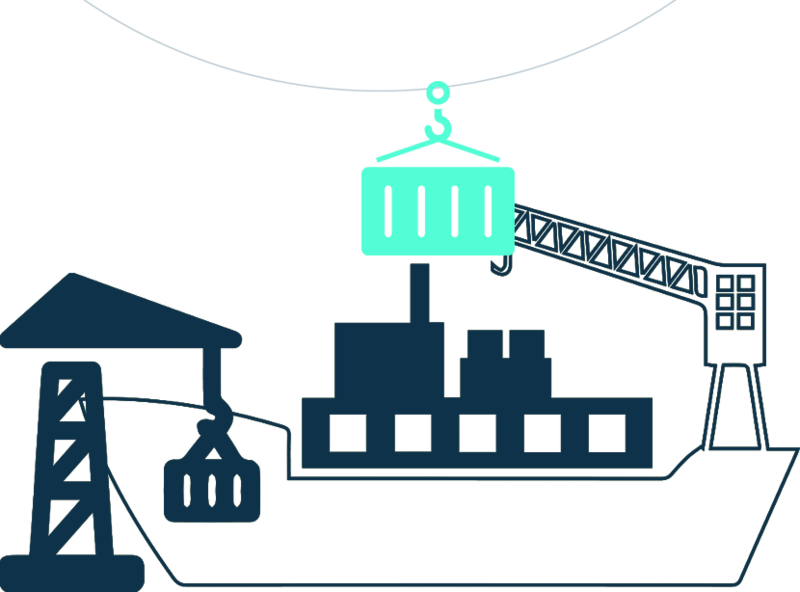 As a result, crucial aspects such as, existing capacity of the ports and attached CFSs, capacity utilisation of existing ICDs/CFSs, future capacity requirements in the project area, extent of traffic congestion in port areas and approach roads to the project, impediments faced by existing units in the area, etc. are not being mandatorily examined during the approval process and approvals are granted merely on the basis of fulfilment of extant requirements specified in the guidelines. DoC in their reply (January 2018) stated that the applicant indicates the traffic projections and the area available for the container circulation at the facility in his application. The application is circulated by DoC to the concerned nodal Ministries and CBEC, who do the due diligence from their perspective. CBEC gets the data and the physical infrastructure created, verified through its field offices. Once all the inputs are received from the nodal Ministries/CBEC, the same are put up to the IMC, which is also represented by senior officials from all these Ministries/CBEC. Further, DoR, a member of the IMC, is the regulatory authority for overseeing operations of all the operating facilities and at the stage of advance circulation of the proposal it examines the feasibility, need and impact analysis of proposal through its field formations. In the IMC meeting held on 19 September 2017, it was decided that in view of promoting Direct Port Delivery and also over saturation of Dry Port facilities at Chennai Port and Mumbai Port, proposals for setting up of CFSs are not to be approved. During the exit meeting, the DoC officials stated that the proposals received by IMC are business initiatives from private developers for which the land is acquired on their own. Investment is made by the developers with the anticipation that it would be viable to run the business on the projected volumes and their success depends on the technology they employ and quality of services offered. DoC’s response regarding consideration of traffic projections in the context of business viability of the developer is not acceptable because IMC should have considered the existing installed capacity in the vicinity of the proposed unit in conjunction with traffic projections made by the developer to assess the viability of the unit. The MoCI guidelines do not lay down any parameters for assessing feasibility of proposals nor do they mandate any agency to conduct a need or impact analysis of the proposed unit. Therefore, there is no uniformity in the assessment process followed for assessing viability of the proposals by the Port authorities or Customs. Further, no instances of refusal on the grounds of excess capacity were noticed during the period covered under audit. Decision to stop further approvals for CFSs has only been taken in September 2017. Though DoC has stated that proposals received by IMC are business initiatives from private developers who would have assessed the viability of the business proposal, fact remains that this has led to a proliferation of ICDs and CFSs in certain regions and in and around major port areas of the country. As pointed out by Audit in the paragraph above, one of the main reasons for under utilisation of capacity created is setting up of multiple ICDs/CFSs in close vicinity of each other. It has also resulted in overstretching of the resources of the Customs department, since Customs staff is required to be deployed in each ICD and CFS and resources like EDI bandwidth and land space need to be provided at each of these ICDs and CFSs. As per Para 5 of Part C of guidelines for setting up of ICDs and CFSs, on receipt of a proposal, the DoC would take action to obtain the comments from the jurisdictional Commissioner of Customs and other concerned agencies within 30 days and the decision of the IMC would be taken within six weeks of the receipt of the proposal under normal circumstances. Further, as per Para 7 of Part C of the guidelines, the applicant is required to set up the infrastructure within one year from the date of issue of Lol. The DoC may grant an extension of six months keeping in view the justification given by the applicant. Thereafter, a report would be submitted to IMC to consider extension for a further (final) period of six months. The IMC may consider extension or may withdraw the approval granted. Thus, the guidelines prescribe a maximum permissible period of two years for setting up of ICDs/CFSs. During the period under audit (2012-2017), the DoC received 94 proposals for setting up of ICDs and CFSs. As of March 2017, one proposal was rejected and 71 proposals were approved by IMC while IMC’s decision was pending in the remaining 22 proposals. It was also noticed that in 16 out of the remaining 22 proposals awaiting IMC decision as on 31 March 2017 (Statement 7), delays ranging from five weeks to 125 weeks beyond the prescribed period of six weeks had already occurred due to non-receipt of comments from CBEC/MoS/MoR. On being pointed out (August 2017), the DoC stated (September 2017) that inordinate delays in receiving comments of the CBEC has been a matter of concern for the IMC and that the 22 pending proposals had been included in the agenda for the next IMC meeting. Further, from the data on 51 under implementation proposals furnished by the DoC (as on 31 March 2017) (Statement 8), it was observed that 12 projects (Statement 9) had remained non-functional for periods ranging from two and a half to more than eleven years from the date of approval, with multiple extensions having been granted by the IMC on the request of the concerned developers. It was noticed that in nine11 out of these twelve cases, the last recorded reasons for their being non-functional were the unavailability of certain facilities from Customs, such as, EDI connectivity and posting of Customs staff or due to the non-issuance of Customs notification. DoC in their reply (January 2018) stated that: DoC as the secretariat of IMC, on receipt of a complete application circulates it to all the Members of IMC for their comments who in turn seek inputs of their field formations. Efforts are made to obtain comments within the stipulated timelines so that the IMC can take a decision. The delays in comments from a Ministry are also reviewed in the IMC meeting. DoC also issues reminders regularly to the members for expeditious submission of their comments after their due diligence. Delay in commissioning of project occurs due to various reasons. In some cases due to Customs notifications, posting of Customs Staff, EDI installation, etc. and in some cases by the developer due to unforeseen financial constraints and natural disasters, which are beyond the control of the developer. However, before granting extensions, IMC carefully weighs the reasons attributed to such delays and takes a considered view thereafter on whether to grant an extension of the LoI. DoC’s response reinforces the fact that delays, both at the stage of grant of approval by the IMC and delays at the project implementation stage defeat the very objective of having IMC as a single-window platform for providing speedy clearance of proposals and facilitation of the process of setting up of ICDs/CFSs. Further, in view of the numerous extensions allowed by the IMC in these cases, the provision of maximum time limit of two years for operationalisation of ICDs/CFSs, as prescribed in the guidelines, has lost significance. M/s KLPL, Kanpur was granted an LoI (June 2010) for setting up of ICD Panki, Kanpur on an area of 6.07 hectare and this area was notified as Customs Area in August 2010 by the jurisdictional commissioner of Customs. However, the Customs Area of the ICD was reduced to 1.62 hectare, i.e. much below the minimum area requirement for an ICD, by the Customs, Central Excise & Service Tax Commissionerate, Kanpur through a ‘Corrigendum’ issued in April 2011, without following the due process of de-notification of a previously notified Customs Area. It was confirmed by the custodian that only 1.62 hectare of land was being used for Customs purposes and the remaining 4.45 hectare was being put to private use, such as for storage of empty containers, domestic handling, etc. Audit noticed that the time taken for stuffing and sealing export cargo increased from 8 days in 2013-14 to 22 days in 2016-17 at ICD, Panki. Similarly, in case of CFS operated by Central Warehousing Corporation (CWC) in Verna Industrial Estate Phase- IIB, Goa with an area of 2.32 hectare, it was notified as an ICD in year 2001 by the Commissioner of Customs & Central Excise, Goa even though it did not fulfil the land requirement for ICD. Further, an area of 1.07 hectare was de-notified in August 2003, leaving only 1.24 hectare area for functioning of the ICD, which was much lesser then the minimum required area of 4 hectare. Justification for relaxation of land requirements and IMC approval was not available on record. On one hand such instances of ICDs/CFSs operating without the minimum area required for the operations, raise doubts as to whether these ICDs/CFSs are able to provide the requisite infrastructure services and adequate security and on the other hand, such instances also indicate that there may be a need to review the criteria for minimum land requirement for ICDs and CFSs. DoC in their reply (January 2018) stated that the response may be furnished by DoR. DoR in their reply (February 2018) stated that factual report is being obtained from the concerned field formations. As per Para 6 of Part C of the guidelines for setting up of ICDs/CFSs, on acceptance of a proposal, an LoI will be issued to the applicant, which will enable the developer to initiate steps to create infrastructure. It was noticed that in two cases, the developers had invested in creation of infrastructure even before the issue of LoI. Vaishno Container Terminal had completed more than half of infrastructure required at the time of applying (May 2012) for setting up of ICD at Tarapur, Thane, Maharashtra. While the LoI was granted in December 2012, the ICD started functioning from August 2014. In another case, LCL Logistics (India) Pvt. Ltd., Haldia was appointed as Custodian and permitted to commence operations as a CFS at Haldia, West Bengal vide Kolkata (Port) Commissionerate Public Notice No. 44/2012 dated 6 December 2012, within 24 days of grant of LoI on 12 November 2012. The average volume of traffic handled by CFS LCL Logistics, Haldia since its operationalisation in December 2012 has been only 15 per cent of its annual installed handling capacity. As observed earlier (Para 3.3(iii)), this low volume of traffic at this CFS is due to the surplus containerised cargo handling capacity available with Haldia Dock Complex (HDC), which serves as the Gateway port for the CFS. This factor appears to have not been taken into consideration by the IMC while approving the proposal for setting up of this CFS. These instances indicate that there may be a possibility that investments already made before issue of the LoI may become an overriding concern leading to IMC’s approval rather than considerations like feasibility or requirement of the project. Since there is no policy on how and when an ICD or a CFS should be set up, there is no restriction on developers to initiate this process without getting an approval from the IMC. The guidelines of DoC are silent on this matter. The IMC, in its minutes of meetings (March 2017) also mentioned that in many cases, developers had started making investments and creation of infrastructure before the issue of LoI. Further, the DoR also pointed out in May 2017 that, in the extant policy, examination of proposals by various ministries takes place only after the developer had already made substantial investment in the project which made the approval a fait accompli. DoC in their reply (January 2018) stated that the guidelines have been revised to the extent that on approval of a proposal, the LoI will be issued to the applicant with conditions as may be considered necessary. Any investment in the development of infrastructure before the issue of the LoI would be at the risk of the developer concerned, and need not be made prior to obtaining the ‘in-principle’ approval of the Jurisdictional Customs Commissioners. The existing guidelines of DoC for setting up of ICDs and CFSs lay down a checklist of steps to be followed while granting approvals that are more procedural in nature, and there is no policy document or framework laying down principles and objectives which would help the IMC members to evaluate the proposals. Further, no role and responsibilities have been defined for the IMC or its constituent ministries beyond the approval process, leaving the sector unregulated. Thus, instead of being an apex regulatory and monitoring body for the ICD/CFS sector, their role is limited to being an approval granting body with no responsibility to monitor the performance of the ICDs and CFSs once they are set up. Lack of information and data on ICDs and CFSs at DoC, which is the nodal ministry hampers taking a holistic view on the infrastructure facilities available for managing container traffic in the country by the IMC, before according approvals. Approvals are given on a case to case basis rather than viewing them against a wider perspective of capacity requirement. Statistics collected by Audit reveal that there is a substantive under utilisation of capacity created for handling container cargo, part of which is explained by the fact that IMC approvals are being granted for new ICDs and CFSs on a case by case basis and without consideration of existing capacity in the region. Delay in granting approval to the proposals for setting up of ICDs and CFSs on account of delay in receipt of comments from the constituent ministries of the IMC defeat the very objective of having IMC as a single window platform for speedy clearance of proposals and speedy facilitation of the process of setting up ICDs/ CFSs. It is recommended that Government may draw up a policy level document for providing a robust framework that comprehensively defines the approval process as well as the monitoring and regulatory mechanisms. Such a mechanism cannot rely on the Customs Laws alone, as it is a legislation primarily for safeguarding government revenue and regulating the cross border movement of goods and does not address the requirements of monitoring and regulation of dry ports sector. DoR in their reply, with regard to setting up of ICDs and CFSs, stated (February 2018) that, role of Customs before issue of notification under the Customs Act, 1962 is recommendatory in nature. Once administrative approval for setting up of ICDs and CFSs is given by the Ministry of Commerce, such ICDs and CFSs are regulated in terms of the provisions of the Customs Act, 1962 and regulations framed thereunder. With regard to legislation for the Dry Ports in the country, Ministry of Commerce through IMC, may take suitable action. During the exit meeting, DoC representatives stated that the issue of ICDs/CFSs could be covered under an overall ambit of Government’s policy for setting up of multimodal transport logistics in the country. It is recommended that a website on ICDs and CFSs may be developed by DoC where updated database and real time information on operations of ICDs and CFSs could be accessed by all stakeholders. DoC in their reply (January 2018) stated that the website developed during the period of audit has real time information on approvals of dryports. The reply does not address the audit concern that at present there is no single source of information or nodal agency that can provide updated status of actual number, location and functional status of ICDs/ CFSs in the country. During the exit meeting, DoC officials stated that a portal on multi-modal transport logistics could be used as a single source of information. DoR in their reply (February 2018) stated that they agree with the audit recommendation.